At least a half hour before baking, place a baking stone in the oven and preheat to 450°F. Roll out your pizza dough to desired shape and size. Poke dough with a fork in several places. Prebake dough for 3 minutes on the hot baking stone. Remove from oven. Top prebaked crust with pizza sauce, then chopped kale, then sliced potatoes, then red onion and shredded cheese. Carefully crack each egg shell in half and gently pour the raw egg on top of the pizza toppings. The egg yolk should stay intact and the white of the egg should only run slightly. Sprinkle salt and pepper on top of everything. 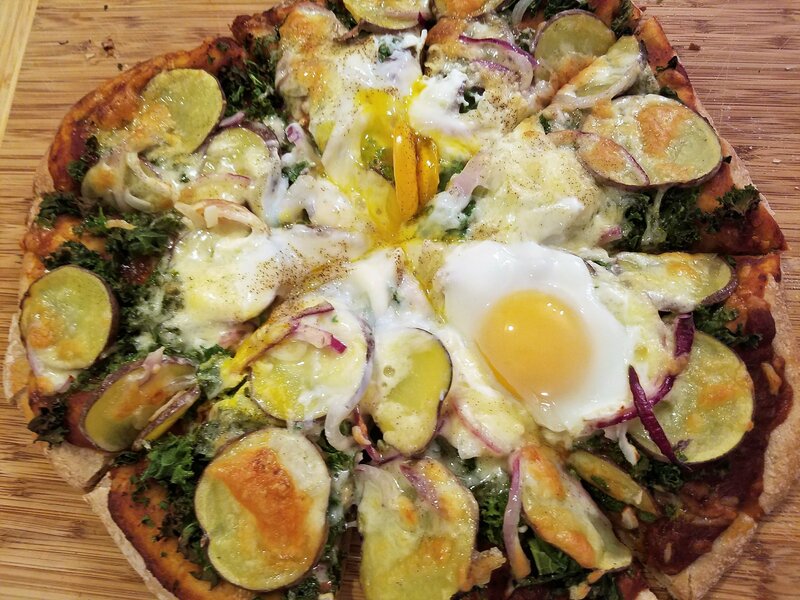 Bake pizza for 7-10 minutes (if using a baking stone), or until crust is done and eggs are set. Enjoy!